Bruce covered the song 4 times, all in 1975. 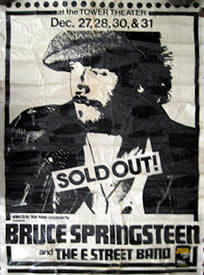 One show, held as a benefit for the ~270-seat coffeehouse, with Springsteen & The E Street Band the sole act on the bill. It was broadcast by WMMR-FM. A wild, majestic version of Chuck Berry's "Back In The U.S.A." was played that night . Held in the school’s Hill Auditorium.. Bruce' 26th birthday......according to "brucebase" the first known DETROIT MEDLEY which inlcudes a complete rendition of Back in the USA. 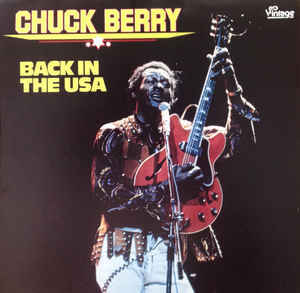 "Back in the U.S.A." is a song written by Chuck Berry that was released in 1959 . The song's lyrics were supposedly written based upon Berry returning to the USA following a trip to Australia and witnessing the living standards of Australian Aborigines: as Berry's biography on the Rock and Roll Hall of Fame website states, with "Back in the U.S.A" "Berry saluted such everyday pleasures as the drive-ins and corner cafes where hamburgers sizzle on an open grill night and day/Yeah, and a jukebox jumping with records like in the U.S.A.
"We just came back from....from Europe, England and a few other places..."
You can bet your life I did, till I got back to the U. S. A. Yes. I'm so glad I'm livin' in the U.S.A.